Herman G. Wollschlager was born in March 1874 at Wisconsin. He was the son of Johann Heinrich Friedrich Wollschlager and Elizabeth Sophia Lutterman. As of 1920, Herman G. Wollschlager was never married. [S317] Kathy Waddell, Saint John Lutheran Cemetery - Sauk County, WI, Row 8. [S246] U.S. Federal Census 1880 U.S. Federal Census, by Ancestry.com, NA Film Number T9-1446 Page Number 285B. SD-2 ED-265 Page 22 Lines 38-44. [S245] U.S. Federal Census 1900 U.S. Federal Census, by Ancestry.com, ED90. Dwelling 119. [S243] U.S. Federal Census 1920 U.S. Federal Census, by Ancestry.com, ED41. Dwelling 39. [S215] Sesquicentennial History Committee, Reedsburg Remembers 150 Years, page 273. Name Variation William G. Wollschlager was also known as William H.
William G. Wollschlager was born on 21 November 1871 at Wisconsin. [S358] Wisconsin Pre-1907 Vital Records (published), Death Record ID: 250837. [S317] Kathy Waddell, Saint John Lutheran Cemetery - Sauk County, WI, Row 12. Name Variation Adele Mathilda Funte was also known as Adelia. Name Variation Adele Mathilda Funte was also known as Adela. Married Name 4 October 1931 As of 4 October 1931,her married name was Wollschlager. Adele Mathilda Funte was born on 4 January 1912 at Westfield, Sauk, Wisconsin. She was the daughter of Carl Funte and Theresa Krey. Adele Mathilda Funte married Milton Henry Wollschlager, son of Johann Heinrich Friedrich Wollschlager Jr. and Emma Louise Dor. Horstmann, on 4 October 1931 at Zion Lutheran Church, Rock Springs, Sauk, Wisconsin. 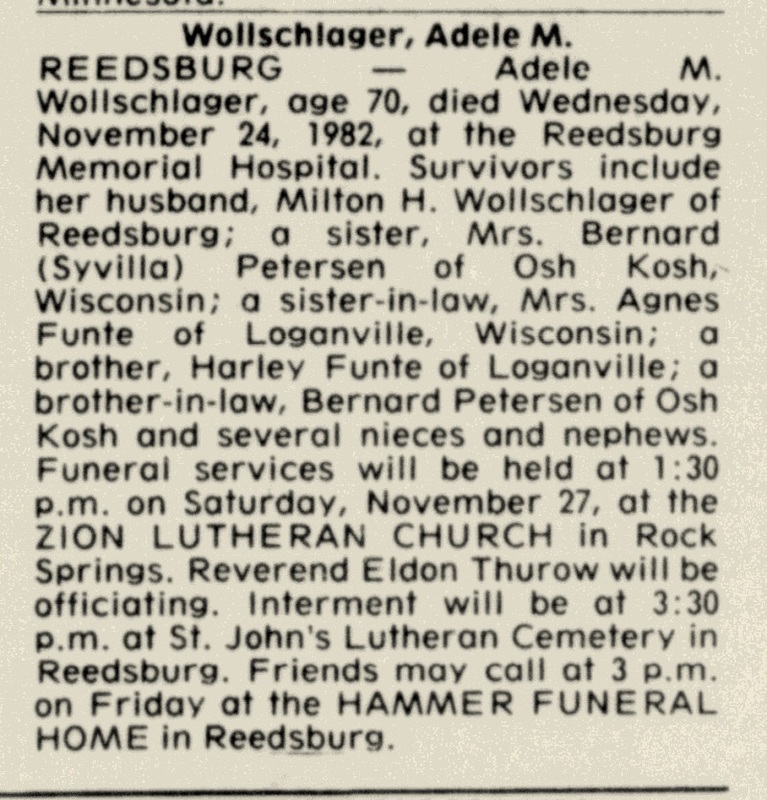 Adele Mathilda Funte died on 24 November 1982 at age 70 Adele (Funte) Wollschlager obituary. 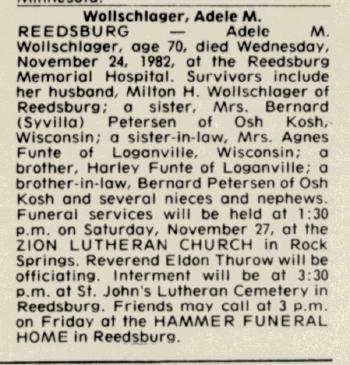 She was buried after 24 November 1982 at St. John's Lutheran Cemetery, Reedsburg, Sauk, Wisconsin. [S243] U.S. Federal Census 1920 U.S. Federal Census, by Ancestry.com, SD-6 ED-171 Sheet 5B Lines 72-75. [S250] U.S. Federal Census 1930 U.S. Federal Census, by Ancestry.com, ED56-39. Dwelling 31. [S373] U.S. Federal Census 1940 U.S. Federal Census, by Ancestry.com, ED56-41. Sheet 7b-8a. Dwelling 129. Henry Walter Albers was born on 23 March 1905 at Westfield, Sauk, Wisconsin. He was the son of Herman August William Albers and Johanna E. W. Meyer. Henry Walter Albers married Leonora Wilhelmina Elizabeth Wollschlager, daughter of Johann Heinrich Friedrich Wollschlager Jr. and Emma Louise Dor. Horstmann, on 23 October 1927 at Zion Lutheran Church, Rock Springs, Sauk, Wisconsin. Henry Walter Albers died on 18 August 1987 at Sauk, Wisconsin, at age 82. Henry Walter Albers obtained US Social Security Card at Wisconsin; last residence Reedsburg, Sauk, Wisconsin. [S243] U.S. Federal Census 1920 U.S. Federal Census, by Ancestry.com, ED171. Dwelling 108. [S250] U.S. Federal Census 1930 U.S. Federal Census, by Ancestry.com, ED56-39. Dwelling 52. Name Variation Herman August William Albers was also known as Herman William. 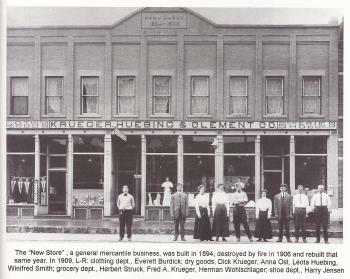 Herman August William Albers was born on 17 December 1870 at Westfield, Sauk, Wisconsin. He was the son of John Albers and Katharina Schulz. Herman August William Albers married Johanna E. W. Meyer, daughter of Carl Friederich Ferdinand Meyer and Ernstine Wilhelmina Friedericka Kutzbach, on 8 February 1894 at Westfield, Sauk, Wisconsin. Herman August William Albers died on 6 April 1927 at Minnesota at age 56. [S246] U.S. Federal Census 1880 U.S. Federal Census, by Ancestry.com, NA Film Number T9-1446 Page Number 138A. Name Variation Johanna E. W. Meyer was also known as Hanna. Married Name 8 February 1894 As of 8 February 1894,her married name was Albers. Johanna E. W. Meyer was born on 23 October 1871 at Dodge, Wisconsin. She was the daughter of Carl Friederich Ferdinand Meyer and Ernstine Wilhelmina Friedericka Kutzbach. Johanna E. W. Meyer married Herman August William Albers, son of John Albers and Katharina Schulz, on 8 February 1894 at Westfield, Sauk, Wisconsin. Johanna E. W. Meyer died on 8 September 1963 at Sauk, Wisconsin, at age 91. Married Name 27 February 1938 As of 27 February 1938,her married name was Wollschlager. Married Name 2 June 1973 As of 2 June 1973,her married name was Schuette. Evelyn S. Knuth was born on 13 March 1919 at Westfield, Sauk, Wisconsin. She was the daughter of Albert Friedrich Knuth and Emma A. Kruse. Evelyn S. Knuth married Norman Frederich Wollschlager, son of Johann Heinrich Friedrich Wollschlager Jr. and Emma Louise Dor. Horstmann, on 27 February 1938. Evelyn S. Knuth married Harold Henry Benjamin Schuette, son of Heinrich Johann Schuette and Augusta Bergwardt, on 2 June 1973. Evelyn S. Knuth died on 30 August 2008 at age 89 Evelyn S. Schuette, age 89 of Baraboo, passed away on Saturday, Aug. 30, 2008 at St. Clare Meadows Care Center. She was born on March 13, 1919 in the township of Westfield, in Sauk County, to Albert and Emma (Kruse) Knuth. Evelyn was married to Norman Wollschlager on Feb. 27, 1938 at St. John's Lutheran Church in Leland; he preceded her in death in 1972. She then married Harold Schuette on June 2, 1973; he preceded her in death in 1977. Evelyn was a member of St. Paul's Lutheran Church in Baraboo. 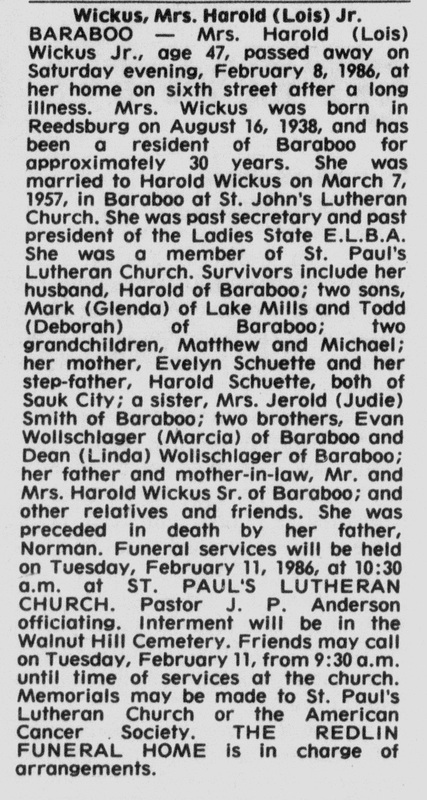 She is survived by, her children, Judith Smith (Bob Gehri) of Baraboo, Evan (Marcia) Wollschlager of Baraboo, Dean Wollschlager of Baraboo; son-in-law Harold (Barbara) Wickus of Florida; stepchildren Lois (Richard) Week, Phyllis (Jack) Gasner; a step child-in-law, Betty Schuette; grandchildren, Mark (Glenda) Wickus, Todd (Michele Yates) Wickus, Terry (Terry Lynn) Smith, Timothy Smith (Kim Prochaska), Brandee (Jeremy) Crabb, Dean Wollschlager II, Kelly (Andee) Wollschlager and Sarah Wollschlager; 10 great-grandchildren; several step-grandchildren and step-great-grandchildren; one great-great grandchild; brothers Adelmer Knuth of Reedsburg, Ivan (Eleanore) Knuth of Sullivan, Raydean (Lavonne) Knuth of Prairie du Sac; sisters-in-law Esther Knuth and Jean Knuth; many other relatives and many friends. She was preceded in death by her parents; two husbands, Norman and Harold; a daughter, Lois Wickus; brothers Wilmer and Leon; a stepson, Robert Schuette; and sisters-in-law Emma and Adela. Funeral services will be held on Thursday, Sept. 4, 2008 at 11 a.m. at St. Paul's Lutheran Church with Pastors Deb and Steve Ohrtman officiating. Visitation will be held on Wednesday, Sept. 3, 2008 from 5 p.m. until 7 p.m. at the Redlin Funeral Home, 401 Madison Ave. in Baraboo; and on Thursday from 10 a.m. until the time of services at the church. Burial will be in the Walnut Hill Cemetery. [S243] U.S. Federal Census 1920 U.S. Federal Census, by Ancestry.com, ED171. Dwelling 86. Sheet 4B. Knuth: Albert F, Head, O, M, M, W, 27y, M, Wis, Farmer, General farm; Emma, Wife, F, W, 22y, M, Wis, None; Evelyn, Daughter, F, W, 10m, S, Wis, None. [S250] U.S. Federal Census 1930 U.S. Federal Census, by Ancestry.com, ED56-16. Dwelling 30. [S373] U.S. Federal Census 1940 U.S. Federal Census, by Ancestry.com, ED56-41. Dwelling 169. He was the son of August Heinrich Knuth and Augusta Pooch. 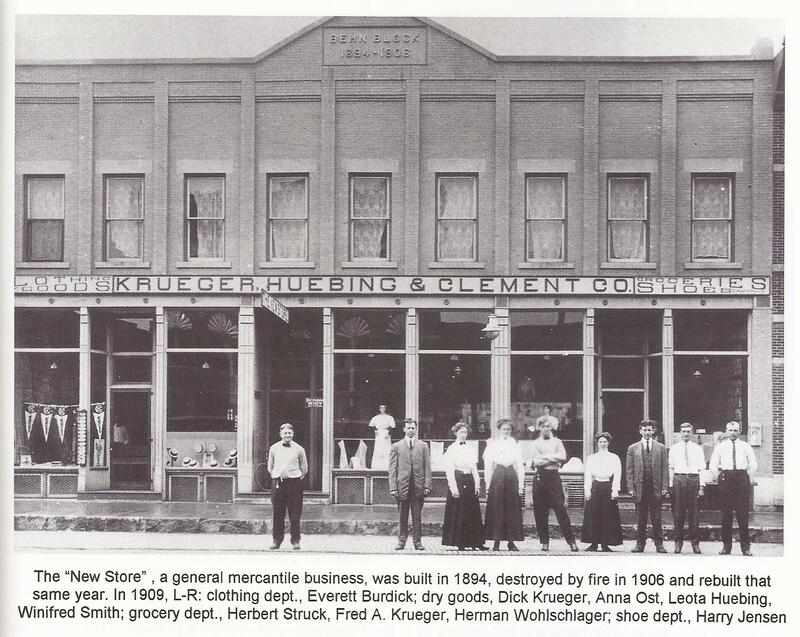 Albert Friedrich Knuth was baptized on 18 February 1892 at Zion Lutheran Church, Rock Springs, Sauk, Wisconsin. Albert Friedrich Knuth died in October 1973 at age 81. Albert Friedrich Knuth obtained US Social Security Card at Wisconsin; last residence Loganville, Sauk, Wisconsin. [S6] Wisconsin, Wisconsin Vital Record to 1907, Reel D0006 Record 012829. [S245] U.S. Federal Census 1900 U.S. Federal Census, by Ancestry.com, ED149. Dwelling 175. Knute: August, Head, W, M, Mar 1855, 45y, M, 19y, Germany, 1883, 17y, Farmer, O, M, F, 9; Augusta, Wife, W, F, Oct 1861, 38y, M, 19y, 10, 8, Germany; Lena, Daughter, W, F, Jan 1884, 16y, S, Wis; Annie, Daughter, W, F, Oct 1886, 13y, S, Wis; William, Son, W, M, 1888, 11y, S, Wis; Emma, Daughter, W, F, 1889, 10y, S, Wis; Albert, Son, W, M, Jan 1891, 9y, S, Wis; Ella, Daughter, W, F, 1893, 7y, S, Wis; Ida, Daughter, W, F, Oct 1895, 4y, S, Wis; Amele, Son, W, M, Nov 1897, 2y, S, Wis.
Married Name 24 October 1917 As of 24 October 1917,her married name was Knuth. Emma A. Kruse was born in July 1897 at Wisconsin. She was the daughter of Herman I. Kruse and Sarah Maria Mary Ott. Emma A. Kruse died in 1955. [S244] U.S. Federal Census 1910 U.S. Federal Census, by Ancestry.com, Year: 1910; Census Place: Franklin, Sauk, Wisconsin; Roll: T624_1736; Page: 10B; Enumeration District: 0115; Image: 902; FHL Number: 1375749. Married Name 7 March 1957 As of 7 March 1957,her married name was Wickus. Lois Emma Wollschlager was born on 16 August 1938 at Wisconsin. She was the daughter of Norman Frederich Wollschlager and Evelyn S. Knuth. Lois Emma Wollschlager was baptized on 11 September 1938 at Zion Lutheran Church, Rock Springs, Sauk, Wisconsin. 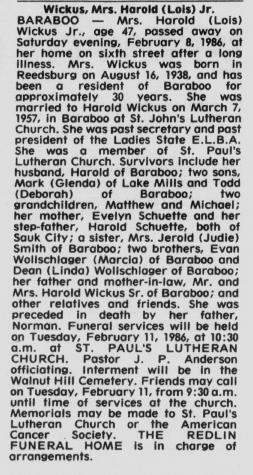 She died on 8 February 1986 at Baraboo, Sauk, Wisconsin, at age 47 Lois Wollschlager Wickus obituary. Lois Emma Wollschlager obtained US Social Security Card at Wisconsin; last benefit Baraboo, Sauk, Wisconsin. Harold Eugene Wickus Sr. was born on 24 August 1911. Wilmer H. Knuth was born on 23 June 1921 at Wisconsin. He was the son of Albert Friedrich Knuth and Emma A. Kruse. 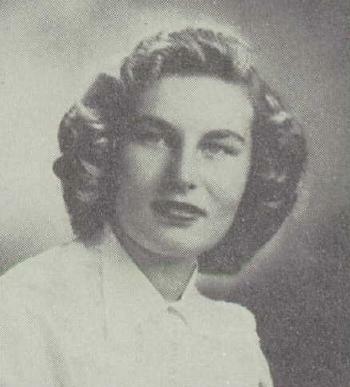 Wilmer H. Knuth married Esther Marie Meyer, daughter of Albert Meyer and Elise Schlieckau, on 22 June 1947. Wilmer H. Knuth died on 19 September 1981 at Sauk, Wisconsin, at age 60. Wilmer H. Knuth obtained US Social Security Card at Wisconsin; last residence Baraboo, Sauk, Wisconsin. Name Variation Adelmer A. Knuth was also known as Adelmar A.
Adelmer A. Knuth was born on 15 August 1923 at Wisconsin. Adelmer A. Knuth married Emma Meyer, daughter of Albert Meyer and Elise Schlieckau, on 4 May 1949. Adelmer A. Knuth died on 27 October 2009 at age 86 Adelmer, age 86, died on Tuesday. He was born the son of Albert & Emma (Kruse) Knuth. Adelmer is survived by his three children, Richard (Sandi) Knuth of Reedsburg, WI, Durlin (Karen) Knuth of Loganville, WI, and Brenda (Michael) Kozlowski of Reedsburg, WI; his daughter-in-law, Mary Knuth of Verona, WI; eight grandchildren, Jennifer, Melissa, Nicole, Brian, Jason, Christopher, Jeffrey and Julie; six great-grandchildren; two brothers, Ivan (Eleanore) Knuth of Sullivan, WI, and Raydean (LaVonne) Knuth of Prairie du Sac, WI; a sister-in-law, Jean Knuth of Prairie du Sac, WI; a brother-in-law, Norbert Paulus of Spring Green, WI; nieces and nephews; and other relatives and friends. He was preceded in death by his parents, his wife Emma, on May 12, 1996; his son Gerry Knuth in June 2000; one sister, Evelyn Schuette and two brothers, Wilmer and Leon Knuth. Funeral services were conducted at Zion Lutheran Stone Church, rural Rock Springs. Interment with military rites was conducted. Married Name 23 April 1954 As of 23 April 1954,her married name was Haney. Jean Marie Schlieckau was born on 24 August 1932 at Sauk, Wisconsin. She was the daughter of George C. Schlieckau and Esther M. Getschman. Jean Marie Schlieckau married Donald R. Haney, son of Lesse Haney and Lucille Dobson, on 23 April 1954 Jean Marie Schlieckau and Donald R Haney engagement announcement. Jean Marie Schlieckau died on 9 August 2014 at age 81 Jean M. Haney, 81, of rural Winchester, Illinois, passed away late Saturday morning, Aug. 9, 2014, at Memorial Medical Center. She was born Aug. 24, 1932, at home near Loganville, daughter of George and Esther Getschman Schlieckau. She attended Edgewood, a rural one-room school from grades one through eight and graduated from Reedsburg High School, where she was salutatorian of her class. Following high school, she worked in insurance businesses in both Reedsburg and Madison. She met Donald Haney during his service in the United States Air Force while he was stationed at Truax Field, Madison. They married April 23, 1954, at St. Peter’s Evangelical Lutheran Church. After serving at Ladd Air Force Base, Fairbanks, Alaska, they made their home in the rural Winchester, Illinois, area. Jean and Donald marked their 60th wedding anniversary this year. Jean was a devoted wife, homemaker and partner in the family farm. She was an avid cook, and a loving mother and grandmother. She enjoyed spending time with her family, caring for her many plants and flowers, and watching and learning about various songbirds. Jean was a member of Christ Lutheran Church, where she was an active participant in the Lutheran Women’s Missionary League, taught Sunday school for many years and served on the Alter Guild. Jean will be greatly missed by sons, Mark (Bobbi) Haney of Nashua, New Hampshire, and Jeff (Cheri) Haney of Winchester, Illinois; five grandchildren, Brett of Manhattan, Kansas, Jessica of Boston, Trevor of Nashua, New Hampshire, Glendon of Chicago and Jordan (Sarah) of rural Roodhouse; sisters, Judy (Carl) Goetz of Colgate, Frances (Pat) O’Brien of Reedsburg and Sylvia Schlieckau and her husband, Michael Benesh, of Madison; as well as several nieces and nephews. She was preceded in death by her husband, Donald, in May 2014; and brother, Dennis Schlieckau. The funeral service was held Aug. 12 at Christ Lutheran Church, 125 W. Jefferson St., Winchester, Illinois. Burial was at Bowers Cemetery near Alsey. Memorials may be made to Christ Lutheran Church or the Winchester, Illinois EMS. The Coonrod Funeral Home is in charge of arrangements. Please visit www.airsman-hires.com to send online condolences to the family. Jean Marie Schlieckau graduated in 1950 at Reedsburg High School, Reedsburg, Sauk, Wisconsin. [S373] U.S. Federal Census 1940 U.S. Federal Census, by Ancestry.com, ED56-14. Sheet 8a. Dwelling 105. Donald R. Haney was born on 21 June 1930. He was the son of Lesse Haney and Lucille Dobson. Donald R. Haney married Jean Marie Schlieckau, daughter of George C. Schlieckau and Esther M. Getschman, on 23 April 1954 Jean Marie Schlieckau and Donald R Haney engagement announcement. Donald R. Haney died on 9 May 2014 at age 83 Donald R. Haney, 83, of rural Winchester, passed away early Friday morning at Passavant Area Hospital in Jacksonville. He was born on June 21, 1930, in Jacksonville, the son of Lesse and Lucille Dobson Haney. He attended Keller Grade School in Scott County and Alsey High School for three years and graduated from Winchester High School in 1948. During the Korean War, he volunteered for four years of service in the United States Air Force and served from 1951 to 1955, at which time he was honorably discharged. During his service, he was based at Ladd AFB in Fairbanks, Alaska on the Defensive Early Warning (DEW) Line. He maintained the F89C/F94C fighter planes that patrolled Canada and Alaska with the 433rd Fighter Group during Russia’s threat to cross the North Pole. Donald married Jean M. Schlieckau in Loganville, Wisconsin on April 23, 1954 at St. Peters Evangelical Lutheran Church. They marked their 60th wedding anniversary this year. He is survived by two sons, Mark (Bobbi) Haney of Nashua, NH and Jeff (Cheri) Haney of Winchester and five grandchildren, Brett of Manhattan, Kansas, Glendon of Chicago, Jordan (fiancée Sarah Frederick) of Rural Roodhouse, Jessica of Boston, Massachusetts, and Trevor of Nashua, New Hampshire. He was a quiet, humble man with an innate love of nature and the land. His passion was farming. He loved working with livestock and enjoyed mushroom hunting. He enjoyed putting out a large garden and sharing the fruits of his labor. He farmed in the Alsey-Manchester area for 60 years. Don was a faithful husband and a caring father who took great pride in his five grandchildren. A funeral service will be held at 11 am Tuesday May 13, 2014 at Christ Lutheran Church in Winchester. Burial will be in Bowers Cemetery near Alsey. Friends may call after 5 pm Monday at the Coonrod Funeral Home in Winchester where the family will meet friends from 6 until 8 pm. Memorials can be made to Christ Lutheran Church. The Coonrod Funeral Home in Winchester is in charge of the arrangements. Dave Schroeder died before December 2003. Name Variation Julius Gottlieb Getschman was also known as Getchman. Name Variation Julius Gottlieb Getschman was also known as Getzman. Julius Gottlieb Getschman was born in December 1871 at West Prussia, Germany. He married Frieda Franzisca Kreofsky, daughter of Robert Krizlaky and Mary (? ), before 1898. Julius Gottlieb Getschman married Lillie H. Kreofsky circa 1899. Julius Gottlieb Getschman was buried in 1943 at Oak Hill Cemetery (North Freedom Cemetery), North Freedom, Sauk, Wisconsin. 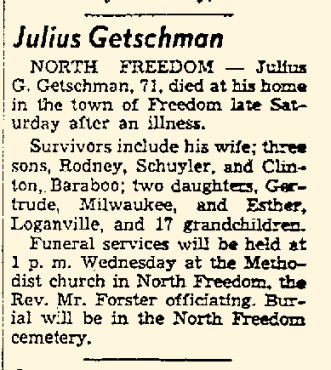 He died in January 1943 at age 71 Julius Getschman obituary. Julius Gottlieb Getschman immigrated in 1885. He was naturalized on 24 October 1895 at Circuit Court, Baraboo, Sauk, Wisconsin. [S245] U.S. Federal Census 1900 U.S. Federal Census, by Ancestry.com, ED135. Dwelling 188. [S244] U.S. Federal Census 1910 U.S. Federal Census, by Ancestry.com, ED116. Dwelling 246. [S243] U.S. Federal Census 1920 U.S. Federal Census, by Ancestry.com, ED211. Dwelling 63. [S250] U.S. Federal Census 1930 U.S. Federal Census, by Ancestry.com, ED56-14. Dwelling 83. Name Variation Lillie H. Kreofsky was also known as Kriofsky. Name Variation Lillie H. Kreofsky was also known as Lilly. Married Name circa 1898 As of circa 1898,her married name was Getschman. Lillie H. Kreofsky was born in November 1873 at Illinois. She married Julius Gottlieb Getschman circa 1899. Lillie H. Kreofsky was buried in 1958 at Oak Hill Cemetery (North Freedom Cemetery), North Freedom, Sauk, Wisconsin. Robert Theodore Getschman was born on 26 September 1898 at Wisconsin. He was the son of Julius Gottlieb Getschman and Frieda Franzisca Kreofsky. Robert Theodore Getschman married Cora Reddeman, daughter of Louis C. Reddeman and Hilda J. Graff, circa 1926. 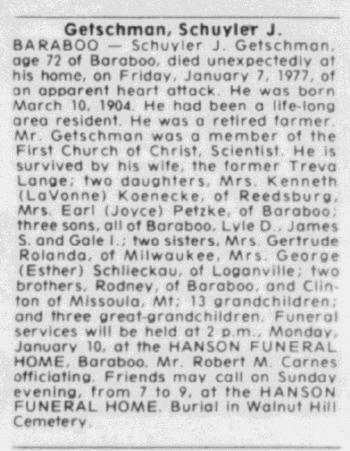 Robert Theodore Getschman died on 7 October 1938 at suicide by hanging, Sauk, Wisconsin, at age 40 Robert Getschman obituary. 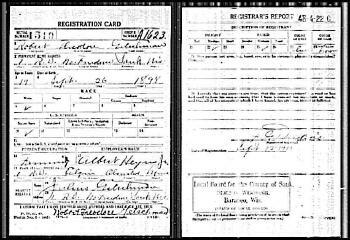 On 12 September 1918 at Sauk, Wisconsin, World War I Draft Registration. [S250] U.S. Federal Census 1930 U.S. Federal Census, by Ancestry.com, ED56-6. Dwelling 22. Rodney J. Getschman married Jessie L. (?). Rodney J. Getschman was born on 15 November 1900 at Wisconsin. He was the son of Julius Gottlieb Getschman and Lillie H. Kreofsky. Rodney J. Getschman died on 27 August 1996 at age 95. He was buried after 27 August 1996 at Oak Hill Cemetery (North Freedom Cemetery), North Freedom, Sauk, Wisconsin. Rodney J. Getschman obtained US Social Security Card at Wisconsin; last residence Baraboo, Sauk, Wisconsin. [S250] U.S. Federal Census 1930 U.S. Federal Census, by Ancestry.com, ED56-2. Dwelling 496. Married Name after 1938 As of after 1938,her married name was Rolanda. Gertrude Isabelle Getschman was born on 14 May 1902 at Sauk, Wisconsin. She was the daughter of Julius Gottlieb Getschman and Lillie H. Kreofsky. Gertrude Isabelle Getschman married (?) Rolanda after 1938. Gertrude Isabelle Getschman died on 25 October 1996 at age 94. Schuyler Julius Getschman was born on 10 March 1904 at Sauk, Wisconsin. Schuyler Julius Getschman married Treva R. Lange, daughter of William H. Lange and Ida G. (? ), circa 1928. Schuyler Julius Getschman died on 7 January 1977 at age 72 Schuyler J Getschman obituary. 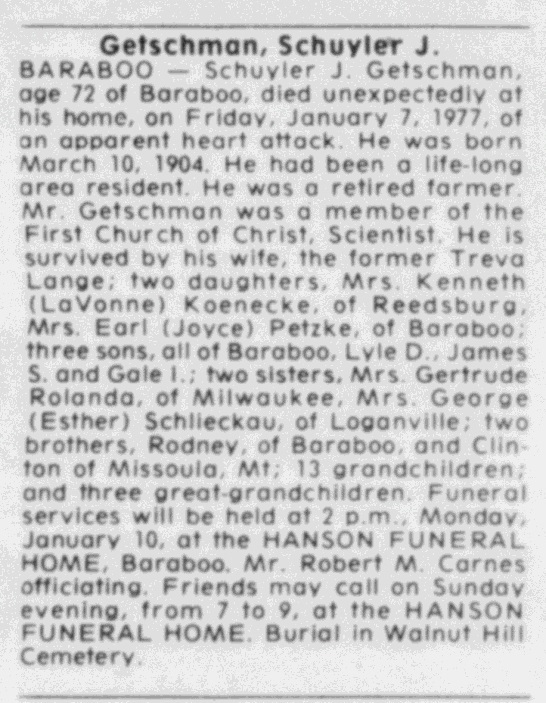 He was buried after 7 January 1977 at Walnut Hill Cemetery (Baraboo Cemetery), Baraboo, Sauk, Wisconsin. Schuyler Julius Getschman obtained US Social Security Card at Wisconsin; last residence Baraboo, Sauk, Wisconsin. Clinton C. Getschman was born on 14 March 1914 at Wisconsin. Clinton C. Getschman died on 22 March 1989 at Missoula, Montana, at age 75. Clinton C. Getschman obtained US Social Security Card at Wisconsin; last residence not specified. Married Name circa 1928 As of circa 1928,her married name was Getschman. Treva R. Lange was born on 8 May 1909 at Wisconsin. She was the daughter of William H. Lange and Ida G. (?). Treva R. Lange married Schuyler Julius Getschman, son of Julius Gottlieb Getschman and Lillie H. Kreofsky, circa 1928. Treva R. Lange was buried in August 1981 at Walnut Hill Cemetery (Baraboo Cemetery), Baraboo, Sauk, Wisconsin. 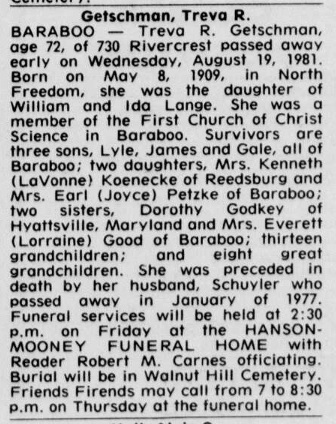 She died in August 1981 at age 72 Treva (Lange) Getschman obituary. Treva R. Lange obtained US Social Security Card at Wisconsin; last residence Baraboo, Sauk, Wisconsin. Name Variation Robert Krizlaky was also known as Kreofsky. Name Variation Robert Krizlaky was also known as Kriofsky. Robert Krizlaky was born at Germany. He died at Oak Hill Cemetery, North Freedom, Sauk, Wisconsin, Co. H, 2nd Wis. Cav. Robert Krizlaky was born circa 1840 at Prussia, Germany. [S246] U.S. Federal Census 1880 U.S. Federal Census, by Ancestry.com, NA Film Number T9-0637 Page Number 204A. Name Variation Charles R. Krizlaky was also known as Kreofsky. Name Variation Charles R. Krizlaky was also known as Kriofsky. Charles R. Krizlaky was born in April 1887 at Wisconsin also reported as 1888. He was the son of Robert Krizlaky. Charles R. Krizlaky died in 1907. Name Variation Clinton Krizlaky was also known as Kreofsky. Name Variation Clinton Krizlaky was also known as Kriofsky. Clinton Krizlaky was born in June 1891 at Wisconsin. Name Variation Cora Reddeman was also known as Redeman. Married Name circa 1926 As of circa 1926,her married name was Getschman. Cora Reddeman was born in 1902 at Wisconsin. She was the daughter of Louis C. Reddeman and Hilda J. Graff. Cora Reddeman married Robert Theodore Getschman, son of Julius Gottlieb Getschman and Frieda Franzisca Kreofsky, circa 1926. Cora Reddeman died after 1938. Keith R. Getschman was born on 2 May 1927 at Milwaukee, Wisconsin. He was the son of Robert Theodore Getschman and Cora Reddeman. Keith Getschman was the superintendent of schools in Stillman Valley when he earned a place in the NIU history books. In the spring of 1965, Getschman became the first person to earn a doctoral degree from the NIU College of Education. That fall, Ed.D. in educational administration in hand, he fulfilled a longtime ambition to become a professor by joining the faculty in his alma mater. Only five years later, he was named chairman of the department of educational administration and services. Retired since 1984, by which time the department had become Leadership and Educational Policy Studies, Getschman died Feb. 14 in DeKalb. He was 79. “Keith was a wonderful department chair,” said Wilma Miranda, chair of the Department of Leadership, Educational Psychology and Foundations. Miranda joined NIU when Getschman chaired the then-Department of Leadership and Educational Policy Studies. Jim Lockard, director of the College of Education’s Learning Center, is another Getschman hire. Born May 2, 1927, in Milwaukee, Getschman began his teaching career in Stillman Valley and kicked off the high school’s football program. During his time at NIU, he was active in the Illinois Association of School Business Officials and held leadership positions. He also served in 1973 as chairman of the Admissions Policies and Academic Standards Committee, which recommended to the University Council to place a greater emphasis on high school class rank and less on test scores. That change took effect with the freshman class of 1974. In the late 1970s, he and two NIU colleagues consulted for the Rockford School District on a three- to five-year plan for facility utilization. Getschman, James Heald and Nicholas DeLuca drafted a controversial plan that recommended the closure of 11 school buildings. School board members followed that advice in 1981. Despite Getschman’s record of active and strong leadership, Miranda said her boss was a quiet and thoughtful man. The College of Education now honors outstanding alumni from its educational leadership program with an annual award named for Getschman. Faculty in educational administration from the Department of Leadership, Educational Psychology and Foundations inaugurated the award. “He was just floored by that. He was so honored. It just gave him a warm feeling,” Mary Lou Getschman said. “He was just a great guy – so many people remember his smile – and he enjoyed working with people. His faculty were like his family in many respects, and he was proud of what they could do and what they did do to enhance the whole program.”. Keith R. Getschman obtained US Social Security Card at Wisconsin; last residence De Kalb, De Kalb, Illinois. (?) Schlieckau was born at Germany.